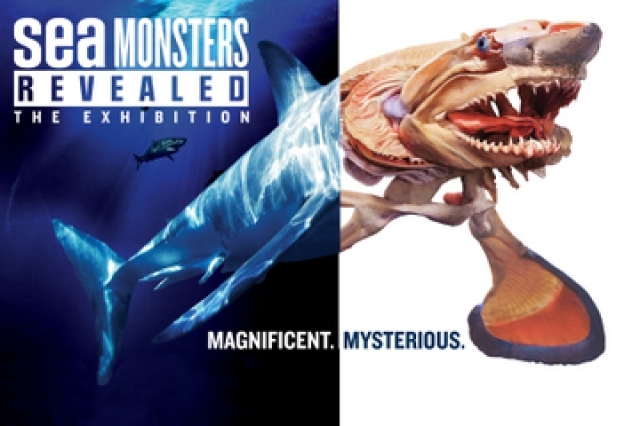 Sea Monsters Revealed: Aquatic Bodies, an extraordinary exhibition of the world's largest plastinated sea creatures, unveiling a unique look at the mystery and magic of the deep sea. The new exhibition invites guests to see both outside and inside the bodies of the most remarkable and elusive sea creatures ever discovered. Deemed 'sea monsters' centuries ago by early oceanic explorers, the sea creatures in this exhibition help guests understand how these animals were designed for the deep. The exhibition includes a 6-foot-wide devil ray, a 15-foot-long mako shark and quite notably, an 18-foot-long, 3,000 pound whale shark. Many, including both the ray and whale shark, are species of which living examples can be viewed in Georgia Aquarium's permanent habitats. All sea creatures in the exhibition are authentic, stunning examples of the mysteries which lie under the surface and beyond the shoreline. Sea Monsters Revealed: Aquatic Bodies uses the revolutionary polymer preservation technique commonly known as plastination to bring real sea animals onto dry land for an up-close look at these mysterious and compelling sea creatures. More than 18, full-body sea creatures will be on display, along with more than 150 individual organs and smaller sea creatures that define the life of the sea. All were carefully recovered in accordance with the highest animal protection standards.